A: The online course is self-paced. Start when you enroll and finish any time within 6 months. Q: How long do I have to enroll? A: There are only 20 seats available to ensure everyone gets feedback. The course will only remain open until the seats are filled. Q: Can I pay with a check or PO? My organization doesn’t provide a credit card for online purchases. A: Absolutely! At checkout, simply select “Pay by Check” and we’ll send you an invoice to forward to your purchasing department. A: You. Every week you get our newsletter filled with grant opportunities that could be helping you DO MORE GOOD. If you aren't seizing those opportunities, join the course and we'll teach you how to make the most of the resources we're sending you for free every week. 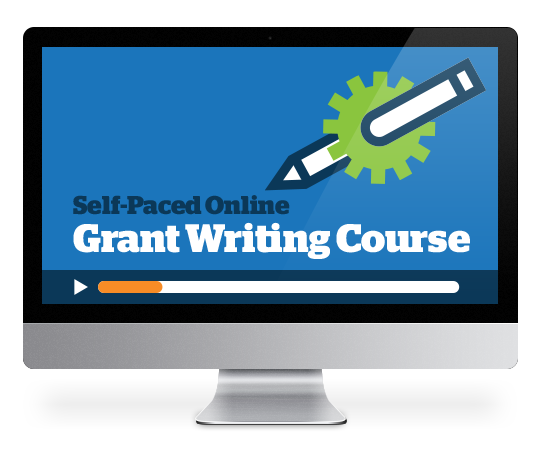 Specifically, executive directors, development professionals, board members, program managers, classroom teachers, K-12 administrators, higher ed folks, and even experienced grant writers and freelance writers who want to learn more about the grant-writing process have all benefited from our training programs. Q: What if I've already participated in one of your other training programs? A: If you've already attended one of our workshops or purchased our video training series, we are truly flattered to have you come back for more. (I am truly touched that so many of my past students have asked about joining this course. Thanks to everyone who has sent an update about how you've used what you've learned and shared your successes. Keep them coming!) If you participated in the past 2 years, we'll gladly credit your past participation fee toward the cost of this course. Q: Will I get proof I've completed this course? A: Absolutely. Full participation in “Grant Funding: Making Grant Writing Work for Your Organization” is applicable for 25 points in Category 1.B – Education of the Certified Fund Raising Executive application for initial certification and/or recertification. Once you complete (and pass) the final exam, you can print a downloadable Certificate of Completion. It's pretty. Frame it. Hang it on the wall. A: The course includes 26 hours of content. Some students have taken longer, some completed it more quickly. 26 hours is an average. The total time may vary depending on the amount of time it takes you to complete quizzes and activities. If you haven't already, download the detailed course syllabus. Q: Where will the course be held? Do I come to your office? A: No. It’s completely online. All you need is an Internet connection and a computer or tablet. A: Regularly, the course is $999, but we're reducing the price by $149 for our enewsletter subscribers. You’ll pay only $850 for 26 hours worth of content. Q: Several people at my organization want to take the course. Do I pay separate enrollment fees for each individual? A: In this case, email us and we'll set up a time to chat. We've encountered similar situations in the past with our workshops and video training and will work with you on a custom solution that meets your organization's needs. Q: Will this course be available again soon? A: When I teach this course, it takes time away from my clients. So while I’d love to do nothing but teach others what I know about grant writing, it’s just not practical. Enrollment is limited to ensure that every student gets the attention and feedback they need. I do not plan to open enrollment again any time soon. Our client stable is packed and 20 students at a time is all I can manage. Q: I have questions. Can I talk to a live person? A: Sure! Our number is (423) 406-2907. We are getting a lot of inquiries, so please be prepared to leave a message and we'll call you back as soon as possible. We're a small office, not a call center, but we promise to return your call within 24 hours.